Rebecca Riese grew up on a farm 3.5 miles out of the neighboring town of Holstein. Holstein is about 20 miles east of Minden. She graduated from Silver Lake High School in 2002. Reise moved to Lincoln for college right out school and graduated from the University in Dec. 2005 with a degree in Agribusiness. She moved to Washington D.C. in Jan. 2006 to work for USDA Federal Grain Inspection Service and back home in July 2007 and to Minden in Sept. 2007. 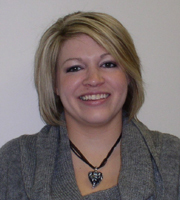 "I moved to Minden for a loan officer job at First Bank," says Rebecca. "I didn’t really research Minden before moving…I had moved back to Nebraska and was at my parents…Kelley, my boss, was great enough to hire me, so I moved into Minden. I have found that housing and the cost of living are more affordable in a small town. People are friendly, willing to help, honest and probably know you or your parents or your grandparents!" "I love being able to walk down the street and smile, stop, have a conservation, wave, etc. and know the people on the street with me. To go into the coffee shop and order “my regular” and Sherri knows what I want…to not have to order when I go to the deli for breakfast because they know me. To have choices for shopping…it’s a small town but there are two coffee shops, multiple bars and eating locations, and specialty shops. I may pay slightly more at Minden Hardware but I didn’t drive to Kearney and fight the crowds at Wal-Mart and that is worth a lot. But if I want or need to, Kearney and Hastings are still very close." "All the events and activities the town puts on are wonderful. The events such as MAADays and Christmas Traditions and the Opera House are great." Quality of Life- Brock and Stephanie Emery move from the large city back to Minden.